Today is our lucky day! 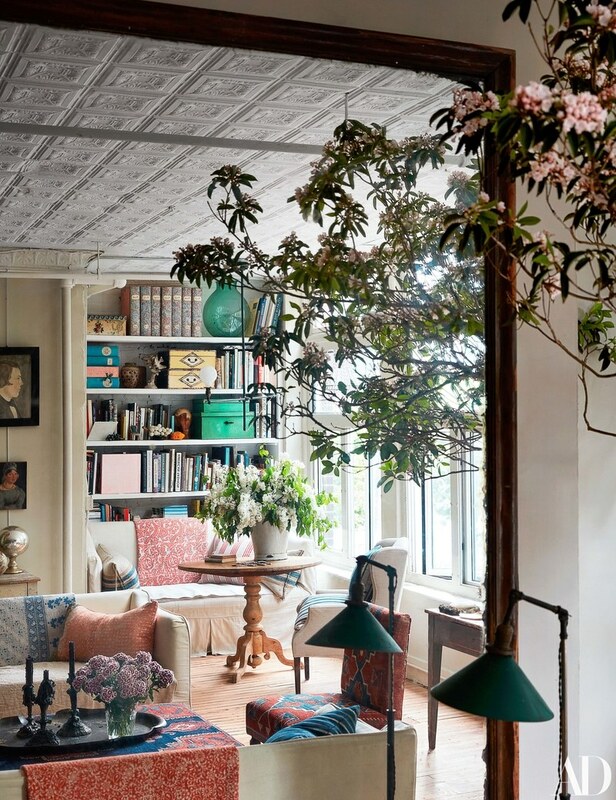 Architectural Digest has published the New York apartment of artist, author, and shop owner John Derian and it is every bit as magical as one might imagine. 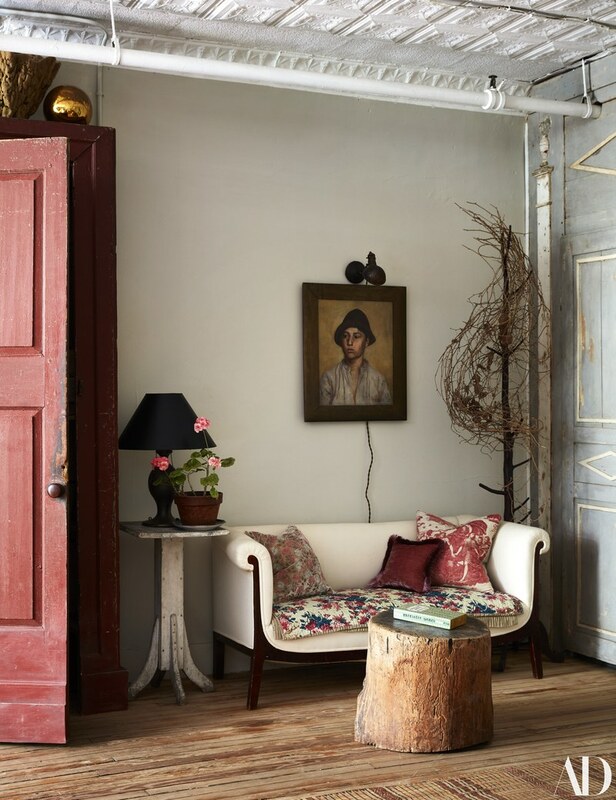 Nestled in the East Village near his beloved boutiques, Derian’s flat is brimming with a whimsical mix of antiques, art, and vintage textiles. 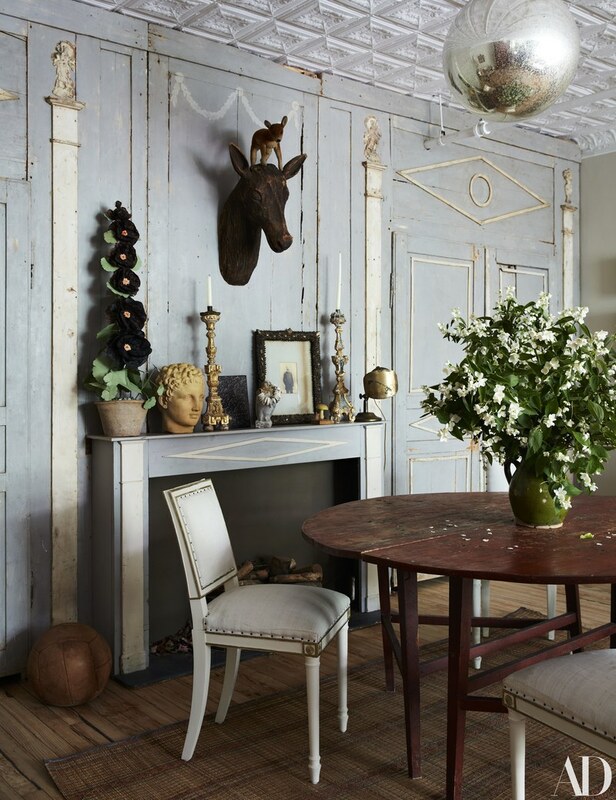 The quirky old building features pressed-tin ceilings, exposed pipes, and now, thanks to Derian, a Gustavian blue 18th-century Swedish wall with two stunning sets of double doors. 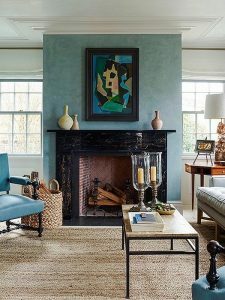 Purchased years ago by a dealer in Antwerp and only recently installed by Derian, the pale blue wall instantly transports visitors to Scandinavia if only for a moment. Below, explore more of the enchanting Manhattan space. 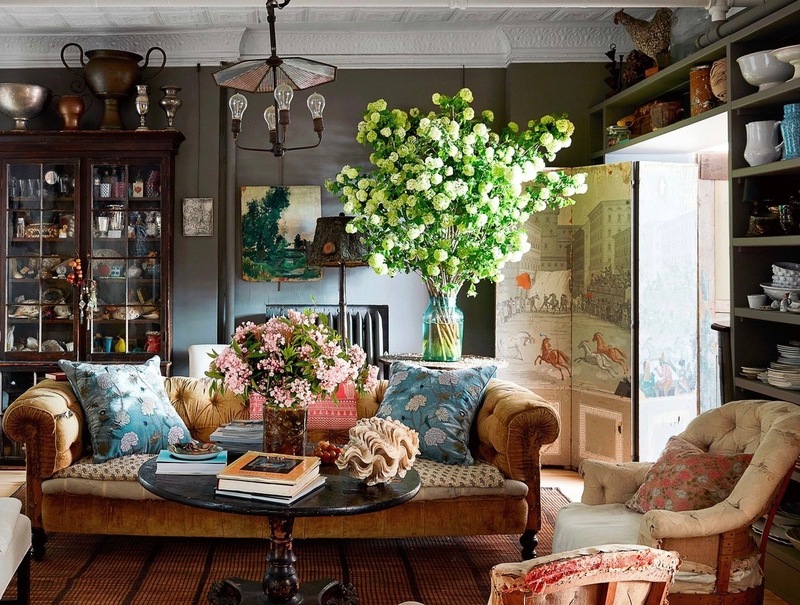 In the kitchen seating area one finds a sofa by John Derian for Cisco Brothers, and antique French armchairs. 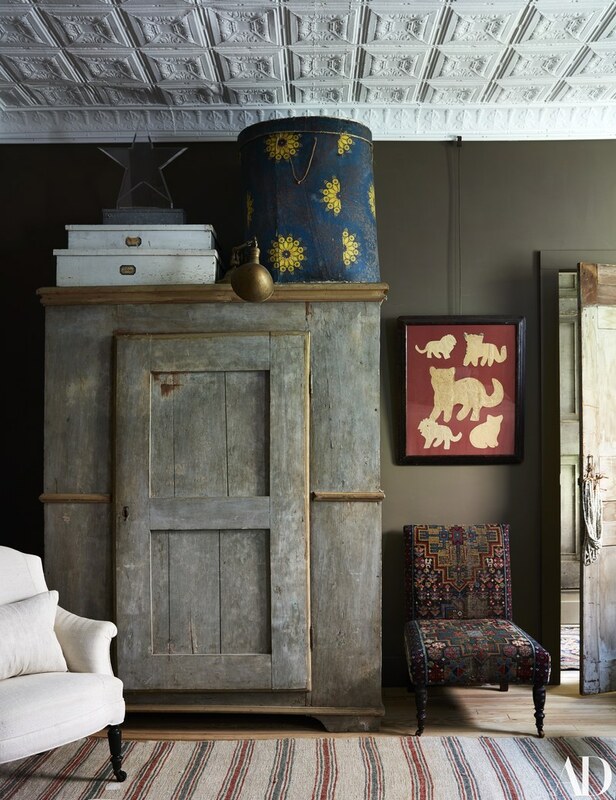 The walls are painted in Farrow & Ball’s mole’s breath. 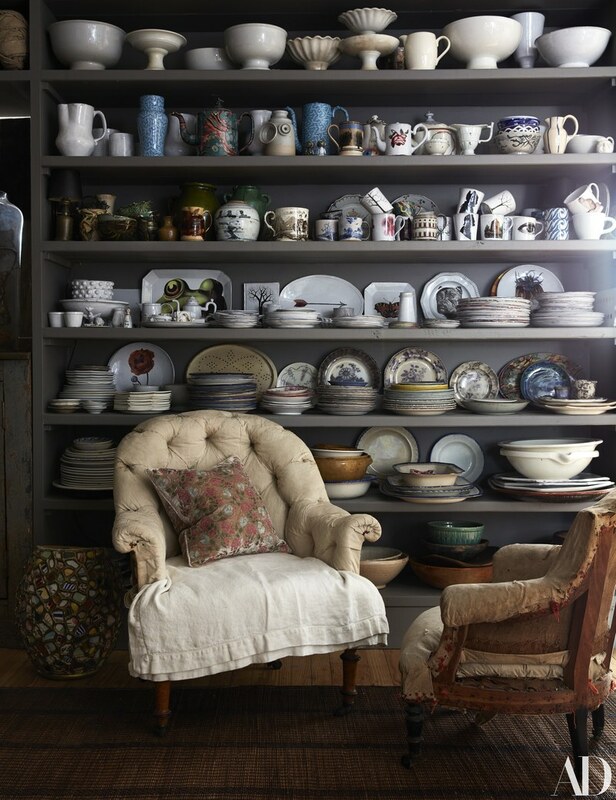 Also in the kitchen, custom shelves display antique and contemporary dishes, including pieces from Derian’s collaboration with Astier de Villatte. The antique chairs are French. 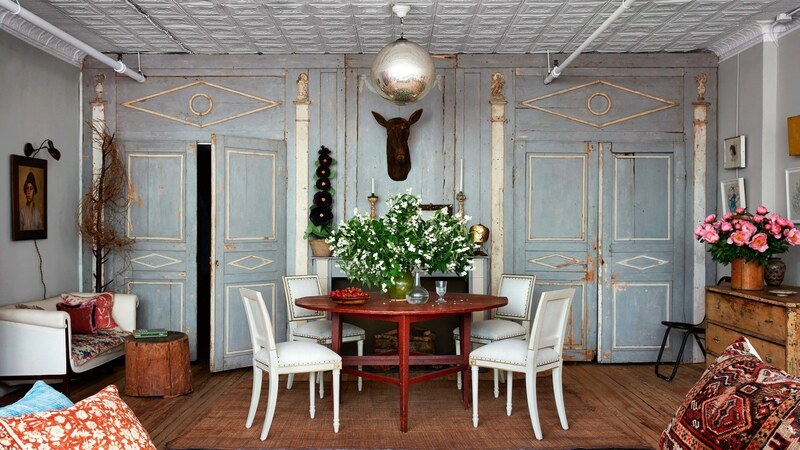 The Gustavian blue 18th-century Swedish wall in all its glory! It bisects the home creating living and dining areas on each side. The dining table is a French antique and the chairs are by John Derian for Cisco Brothers (covered in an antique linen, naturally). 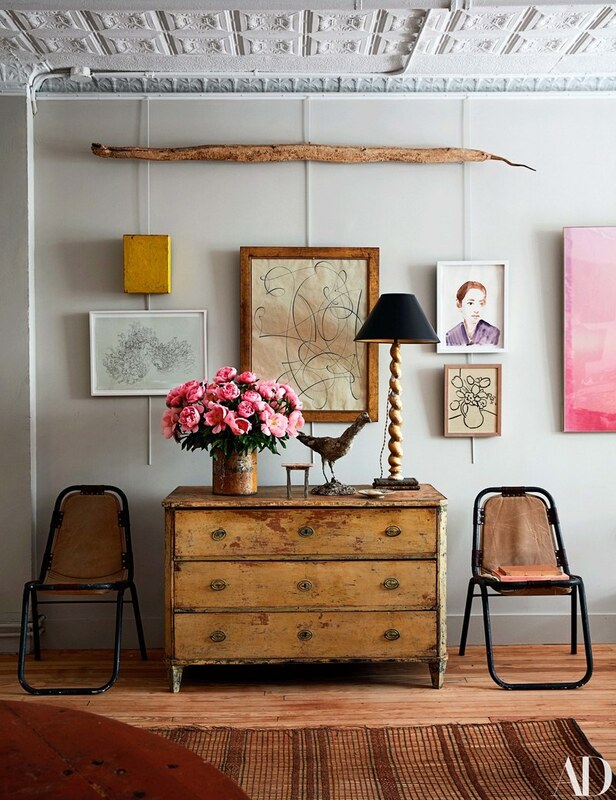 I love the artwork by Elliott Puckette hanging in the dining room (those enormous coral peonies aren’t too shabby either). The vintage military chairs and the chest are all French antiques. A close-up because it’s too dreamy not to. A tree stump table sits before an antique French settee in a dining room corner. 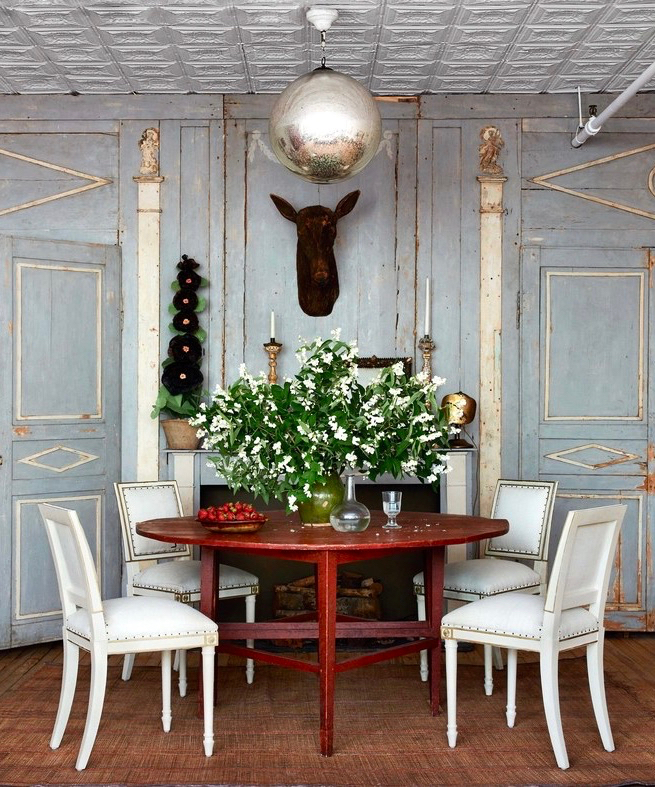 How handsome is the antique hand-carved wood deer hanging over the mantel? The paper hollyhock is by the Green Vase and is available for purchase through Derian’s shop. The light fixture is in fact a large German kugel pendant. 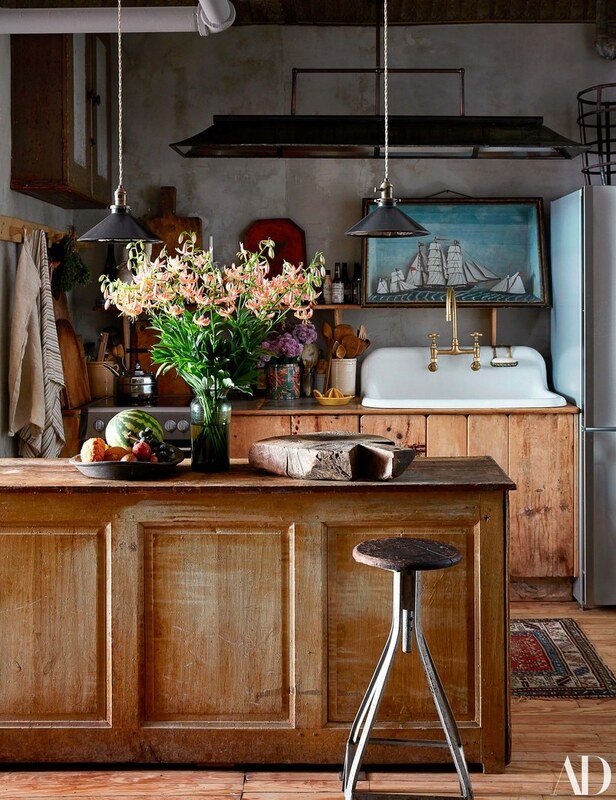 I especially adore the kitchen because it hardly looks like a kitchen at all! 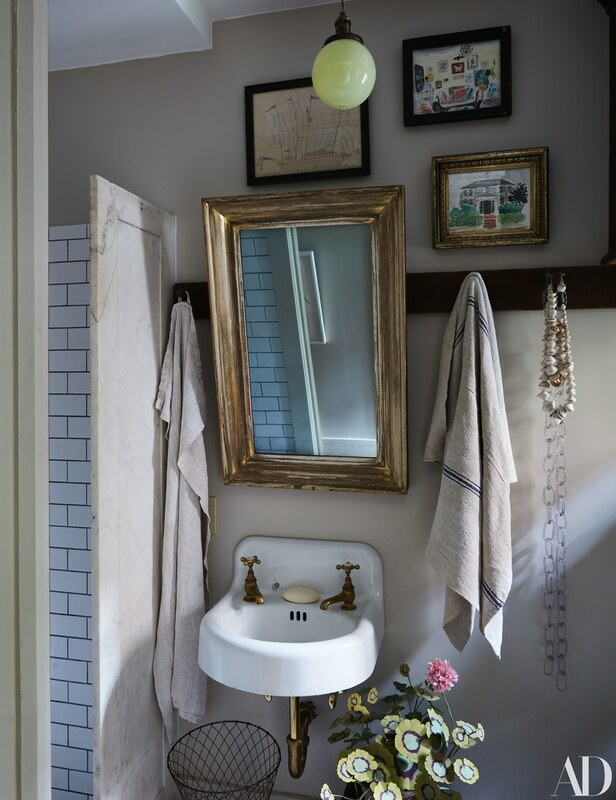 The pendant lights are by Robert Ogden and above the antique sink hangs a 19th-century diorama (I am officially on the hunt for one for Gabriel’s nursery!). 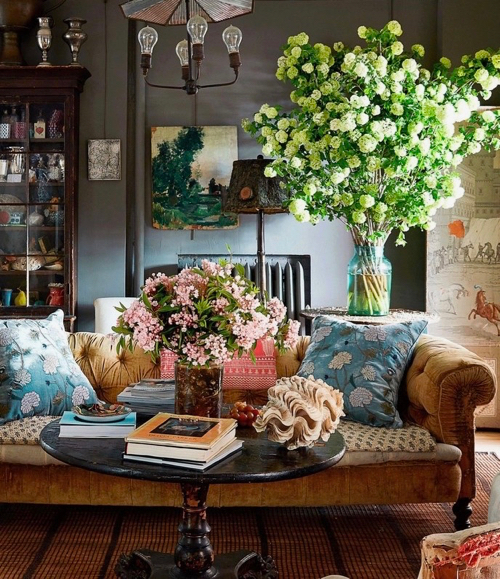 The light-filled living room includes a bench and pair of sofas by John Derian for Cisco Brothers. The gorgeous throws by Jeanette Farrier are available in Derian’s shop. 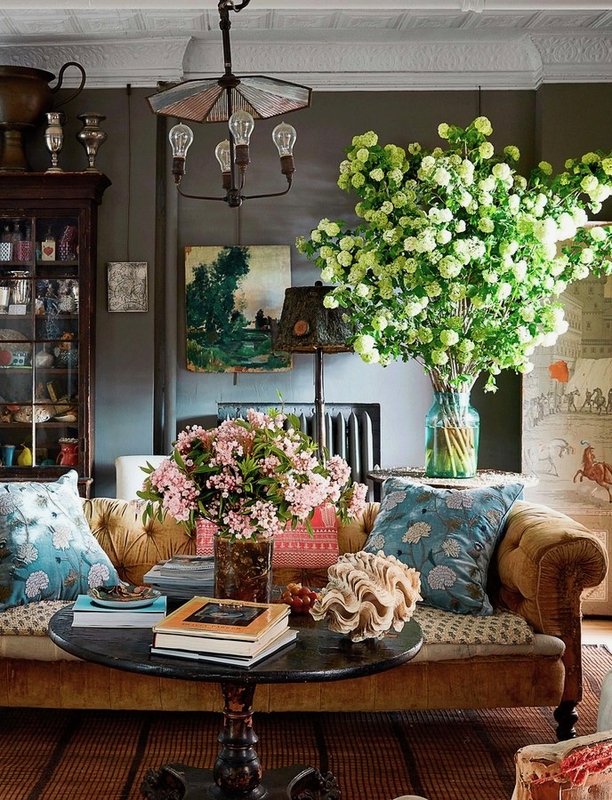 A paint palette by Peter Gee makes a statement hanging in the far corner. The living room reflected in an antique mirror. I love the round Swedish side table and layered textiles. 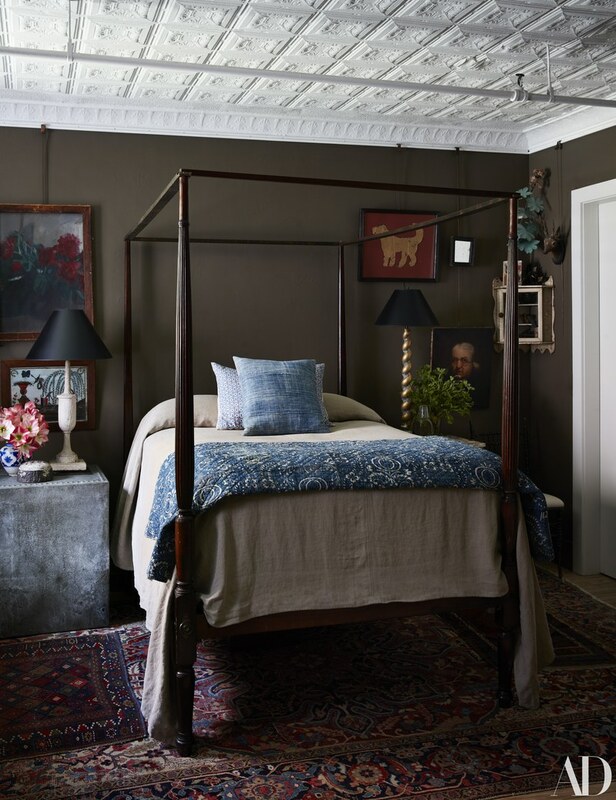 The walls of Derian’s cozy bedroom features is painted in Farrow & Ball’s mouse’s back. The canopy bed and rugs are antiques. How handsome is that slipper chair upholstered in an antique rug? The armoire is an Italian antique and the striped runner is French. In the bathroom hangs paintings by Bella Foster (I’ve adored her work since her early designs for Kate Spade) and a 19th-century mirror. The paper geranium is by the Green Vase. 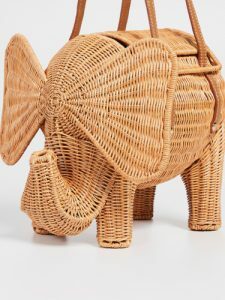 « Little Loves: Seashell Sunglasses and more! I love John Derian and officially hate my house now! The Swedish wall! The diorama! The chairs around the dining room table! All of the paintings that I love on his wall! 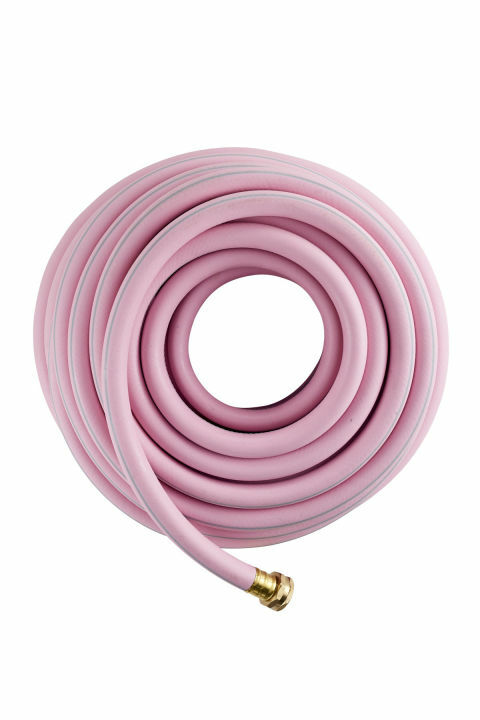 It is just too fabulous to name every single thing, but it is just all perfect. What a man! *le sigh* The whole home is just amazing. Liz – It was an old joke between Nancy Lancaster and John Fowler I believe! 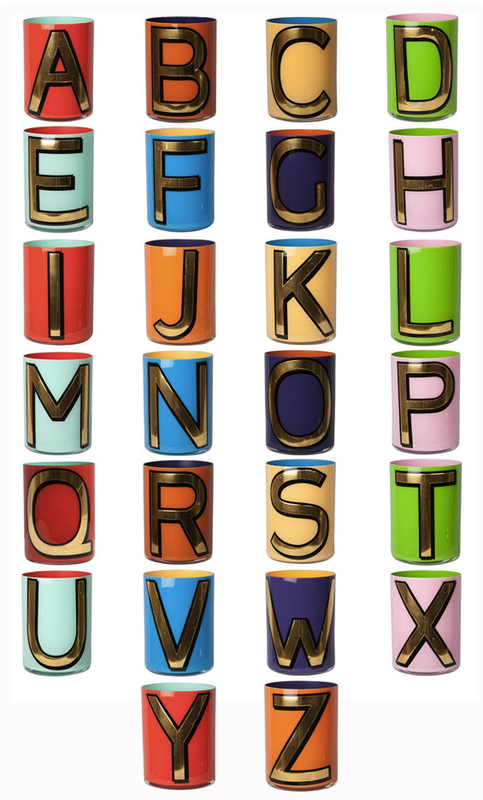 They were always giving paint colors funny names and Farrow & Ball continues them to this day!